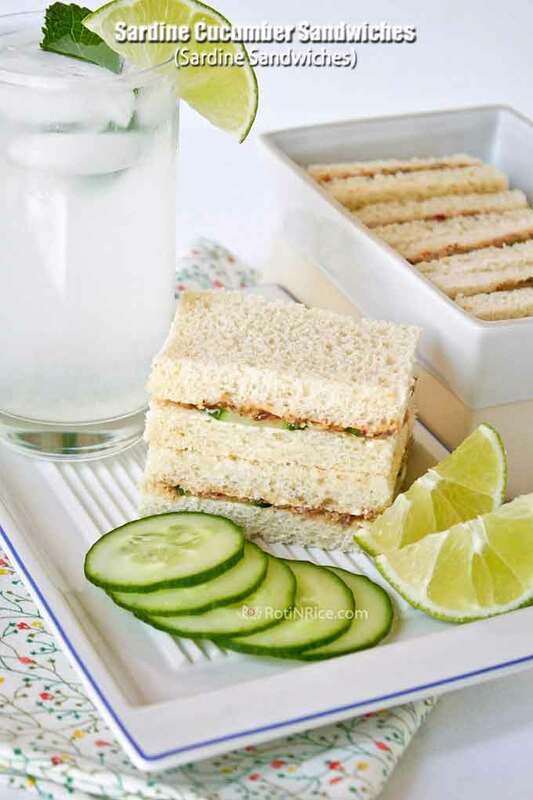 Just as Nasi Lemak Bungkus is ever present in daily Malaysian life, Sardine Cucumber Sandwiches a.k.a. Sardine Sandwiches are conspicuous at parties and functions throughout Malaysia. During my schooling years, every class party was replete with these crustless, rectangular or triangular sandwiches. No party would be complete without them. Usually two to three families would step up to the plate to provide enough Sardine Sandwiches for a class of forty to fifty students. They were popular, a treat for special occasions. 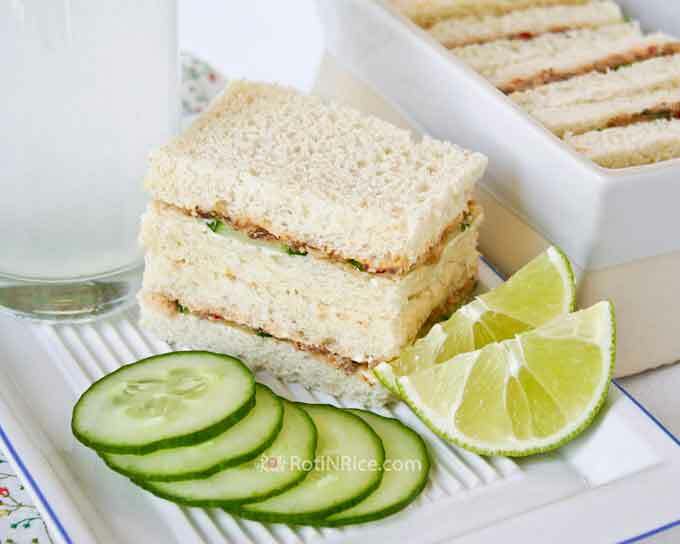 Most kids grew up on a rice based diet and dainty sandwiches were not their usual snack in those days. They were indelibly etched in my memory. To see a picture of my elementary class party, please click here. My last class party was more than two decades ago. Sadly, these sandwiches seldom made an appearance in all this time. It isn’t as if they are difficult to prepare but more so that I needed a reason to make them. When it was my turn to specify the theme for this month’s cook-out with Denise, I immediately suggested sardines. She agreed but was apprehensive right from the start that we would both come up with the same recipe. She knew that I knew that she knew what I was going to do with my can of sardines, but I went ahead anyway. I really wanted to eat these Sardine Sandwiches. After some deliberation, we settled on the name Nona-Nona which pretty much describes both Denise and I. We have each created a page with brief details of our individual backgrounds and how Nona-Nona came to be. You will also get to read about the name and the logo. Do check it out. And so I happily ran off to the Asian grocery store to buy a few flat oval cans of sardines in tomato sauce. Sardines in these cans are of the smaller variety and are packed whole in the cans. Sardines in the cylindrical cans are of the larger variety with coarser flesh. Only a portion of the fish is packed into each can. 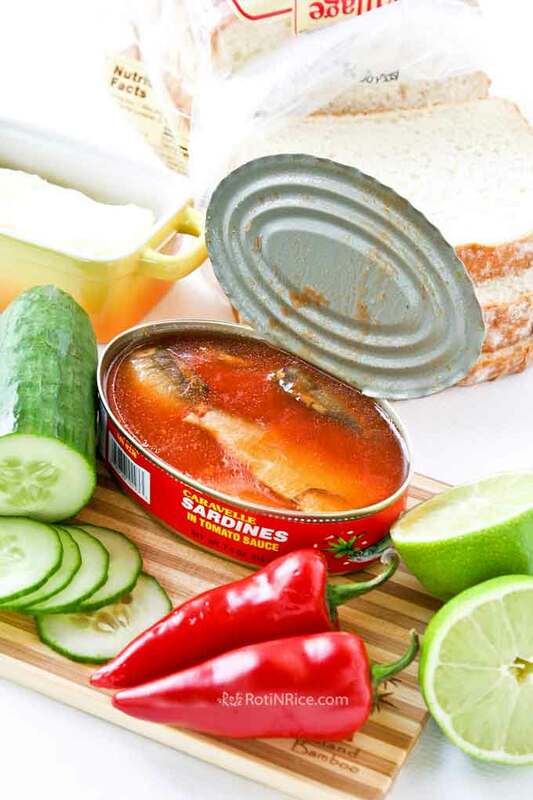 Sardines packed in flat rectangular cans found at the regular grocery stores can be used but they do taste different. For some, sardines can be a little fishy. Lime juice and chopped red chilies help reduce the fishy odor. Butter combines very well with the filling and makes the sandwiches very tasty. Transfer sardines from can with about a tablespoon of the tomato sauce. Discard the rest of the sauce. Remove bones from sardines. Add lime juice, chopped red chilies, salt, and pepper. Mash and mix everything up with a fork. Butter the 8 slices of bread. Spread an even layer of mashed sardines on 4 slices of bread. 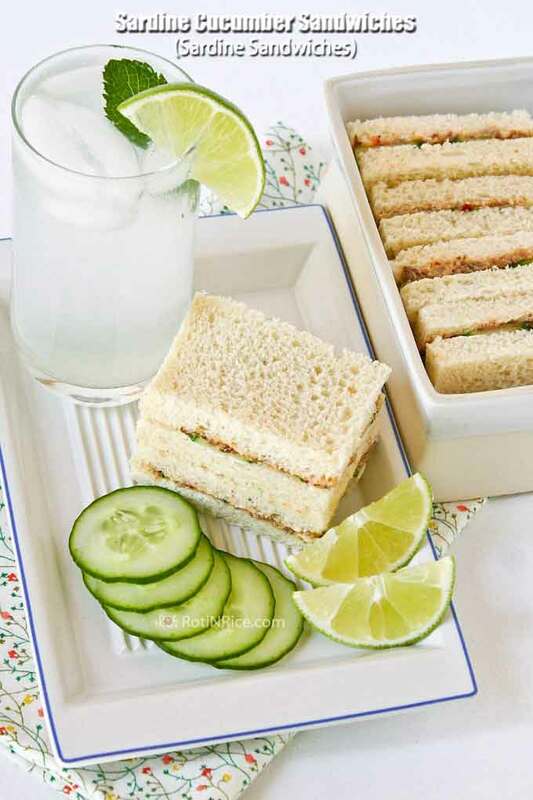 Place about 6 slices of cucumber on top of the sardines and sandwich with the remaining 4 slices of buttered bread. Slice off the crust on all sides with a very sharp knife. Cut the sandwich into half to form rectangles or triangles. Serve immediately. One of the most fun part of this get-together is that neither of us know what the other is preparing. There is always the “fear” of us making the same dish and it is funny how we would drop hints but always careful never to “let the cat out of the bag”. Hence, the anticipation until the big reveal on the day of posting. Let’s head over now to Singapore Shiok! to see what Denise has prepared. Biren!!!! You really made sardine sandwiches!! lolol So glad I went with my gut and made what I did though I was reluctant to because of all that mad pinching 😀 Mee- owwww!Your sandwiches look divine dah-ling! So refined, I know my pinky will automatically stick out if I eat them! The secret’s out – we’re a couple of sardine chomping nonas 😀 Ummmm… guess what? I used those rectangular can sardines. 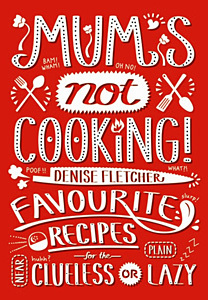 *whispers* They even had dill in them, but I didn’t have anything else in the cupboard, and they were still delicious cos the curry powder drowned everything else out *shhhhhh* Thanks for the cookbook mention, hope your readers will participate too cos I really, really want to give those cute as a button books away! YES, I did! I wanted to all along. That was why I suggested sardines and I knew that you knew. 😀 Sardine chomping nonas? LOL! Meow back atcha! Doesn’t matter if you are going to add spices and curry powder to those sardines. Any kind will do. I have several cans of those in my pantry…MEOW! I can’t wait to see your cookbook. The cover is really cute. CONGRATS my friend! Hey!!!! Is that pandan limeade??! Great sandwiches! I love sardines, I wish my bf felt the same :-). But on the other hand, I get to eat them all :-). This sandwich is certainly something to try! And it’s quick – a very valuable feature for me these days! Thanks for sharing, Biren! I always have a few cans of sardines I my pantry and these sandwiches can be put together in minutes. Makes a wonderful lunch. 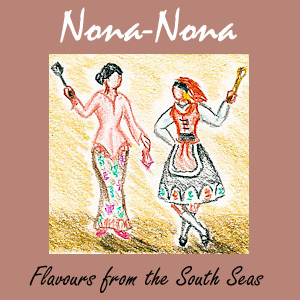 Love your Nona-Nona badge, very nyonya-ish:D You could publish a cookbook too with all the wonderful recipes in this blog! You made the most simple of recipe looks good! Aww…thank you so much for all your kind words and support. It is much appreciated. Looks like a perfect lunchbox item. Biren, u may like to chk out my beauty guide for this month: May BellaBox Comes With A Reusable Bag!! Sardine sandwich is my family’s favorite! My daughters love bringing it to school just like me when I was a little girl. It’s just so good! These sandwiches are good anything time of the day. They are so light and tasty. Wow these sandwiches look delicious! Perfectly soft and salty and fresh… I want them! These sandwiches look so delicious, Biren! I love the crunch of cucumber in my sandwiches! This sardine sandwich looks great with the crunchiness of the cucumber…great for a light lunch. Will hop over to Denise. Haven’t checked out her blog yet, but I’m thinking she’s making sardine puffs??? They are beautiful little sandwiches, but I have to admit that sardines are not my friend. I know my husband would LOVE these sandwiches so He might just have a treat coming. Tuna will definitely work. I think most people here prefer tuna. When I first moved here many years ago, I was curious about tuna. The texture is different but I enjoy both. I’ve never had a sardine sandwich! I know, I know – why have I been wasting my life? Anyway, these look spectacular. Good recipe, good post – thanks. I like that these sandwiches are so easy to prepare yet to nutritious and tasty! Those days we only used white bread, never heard of whole grain or whole wheat bread. Seems like white bread is no longer popular, but I still love them especially when making these sardine sandwiches. Just tastes better even though it is not as healthy.